Bernie for President! – Wait! Did I just say that? 1. Wealth redistribution is the best way to make the bottom 99% wealthier. 2. Society is much better off when decision-making powers are taken away from individuals and instead placed in the hands of politicians and bureaucrats. Thus, all human actions are subject to regulation by the government. If enough people in a free society like ours can be convinced to accept these two false premises, then we lose everything. Most importantly we lose our freedom. When we lose our freedom, a loss of prosperity is sure to follow. This process has already begun in the United States. This tendency in human nature is a godsend to politicians who seek and maintain power by promising “the people” something that is paid for by someone else. Hence, Hillary Clinton recently rolled out her “New College Compact” where she claims “costs won’t be a barrier” to higher education if she is elected. How will her plan make up the difference in college costs when the portion of total college tuition paid by students is lowered? The truth of the matter is that if Hillary’s administration convinces colleges to require less tuition from students, it is the taxpayers that will make up the difference. College administrators will not agree to a cut in salary – they are not dumb. The result will be a new bureaucracy that puts a dollar in the left pocket while pulling $1.50 out of the right. After all, as everyone knows, bureaucracy is expensive and must be paid for. In reality Hillary’s plan will not lower absolute costs; it will only place a higher burden on taxpayers, meaning all taxpayers will have less of their own money to save for college tuition. It will be a really raw deal for middle-income taxpayers without children. Hillary’s plan would certainly add to public debt, which at the federal level is already above $18 trillion and growing. Chalk it up to greed or envy, but whatever the cause – politicians are aided in their tax grabs and debt spending by constituents who believe in the free-lunch fiction of modern politics. It’s a belief system that collectively makes all of us poorer. If the redistribution of wealth promoted by the political class proves too great for the electorate to resist, then the country will continue its current decline into economic mediocrity or worse. 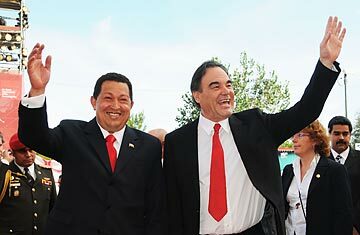 American Hollywood producer Oliver Stone (right) with his late revolutionary hero, Hugo Chavez (left). Nicolas Maduro, the current socialist leader of Venezuela is shown in the right background. Sean Penn, Michael Moore and Oliver Stone should be leading a humanitarian campaign using their own funds to help the Venezuelan people. Why? Because the Venezuelan people are literally dying due to the policies of the late Hugo Chavez (d. 2013) and his protégé Nicolas Maduro – socialist dictators that those Hollywood fools have publicly embraced in the past as champions of the people. Hollywood lefties, and their allies in government like Bernie Sanders who apparently do not understand the first thing about market economics, and who cannot comprehend the lessons of history are the last people anyone should be listening to for advice on public policy. The socialist policies that they have so publicly celebrated have destroyed what was once the wealthiest Latin American country. Socialism – price controls, government ownership of businesses, central planners who are not interested in a diversified economy, command regulation of the private sector – these are the reasons for the collapse of the Venezuelan economy. But the Venezuelans did it to themselves – they elected Hugo Chavez in the first place. It can happen here. Profit-seeking entrepreneurs in a free economy would never let store shelves go bare in Venezuela or anywhere else. 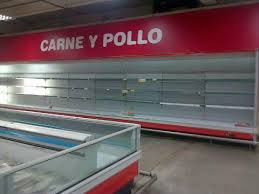 Only socialist planners like Hugo Chavez and Nicolas Maduro could let this happen. History tells us over and over again that government-imposed price controls lead to scarcity every time. Look at what the news outlets have recently reported on or written about the situation in Venezuela – the socialist government there has wrecked her economy while blaming others and it continues to bring misery and terror to her citizens. “Mr. Maduro’s regime is a de facto satellite of Havana: Thousands of Cuban operatives are seeded in its security services and, in a deal that has long propped up the Castro regime, Venezuela supplies Cuba with 100,000 barrels of oil a day in exchange for the services of a few thousand doctors. “Repression in Venezuela has steadily escalated this year: More than 40 people were killed when security forces cracked down against opposition street protests, and bogus criminal cases have been brought against senior opposition leaders. One, Leopoldo López, has been imprisoned since February. Stand-up Comedian Laureano Marquez “dwelled on the absurdities of life in this oil-rich nation, where gas is cheaper than water but it’s hard to find milk, toilet paper and many other everyday goods. “Lines are increasingly filled with smugglers who buy subsidized goods and resell them at a profit on the black market or in neighboring Colombia, generating tension between resellers and those trying to stock their own kitchens. “Josefa Bracho, a 70-year-old teacher in the central city of Barquisimeto, vows not to stand in any more supermarket lines. She was slashed in the thigh with a scalpel after a dispute in a line with women she believed were smugglers. ‘“We’d been in line for almost four hours when three women got in front of me,” said Bracho in a telephone interview. 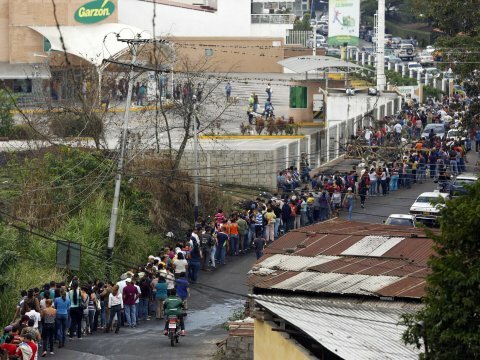 Food line outside a supermarket in Venezuela, 2014. Long live the socialist revolution! New York Times Editorial Board, Aug. 7, 2015 – “On Monday, officials in Venezuela announced that a leading opposition politician, María Corina Machado, will be barred from running, along with a handful of other government critics. Another leading opposition leader, Leopoldo López, has been imprisoned since February 2014, facing spurious charges. “Venezuelan inflation will average 86 percent in 2015, up from 57 percent last year, according to a median estimate of 12 analysts surveyed by Bloomberg. “The survey produced a wide variation of estimates after the government halted the regular publication of official statistics in December when the annual rate hit 69 percent. Morgan Stanley had the lowest forecast in the survey at 65 percent, while Caracas-based Ecoanalitica is expecting prices to rise 139 percent this year. “The economy of South America’s largest oil exporter will see the deepest recession since 2009 this year with an expected contraction of 5.6 percent, according a survey of 15 analysts. “Many Venezuelans have to carry wads of cash in bags instead of wallets as soaring inflation and a declining currency increase the number of bills needed for everyday purchases. The situation is set to get worse. Inflation, already the fastest in the world, could end the year at 150 percent, said the official. The lesson for Americans – reject the temptation of socialism – it will bring nothing but misery upon you, your children and future generations. Need another example. Look at Greece. If you vacation there, ask the Greek people you meet if their retirement plans are going according to the promises of their politicians. Socialism necessarily leads to an increase of government power at the expense of individual freedom. It is a system where government dictates every aspect of our lives – who we may or may not associate with, what we may or may not eat, who we may or may not hire, what we must pay our workers, it dictates nearly all aspects of the employer/employee relationship, how we save for retirement, what speech is acceptable or not. According to socialists the list of human actions that must be regulated is infinite. Don’t think it can happen here? It’s already begun. America’s flirtation with socialism has certainly gained steam on President Obama’s watch. It’s time to reverse the tide before we reach the point of no return like Venezuela has. 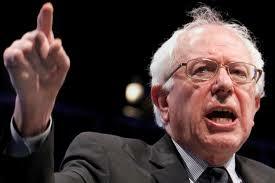 Finally, I would like to nominate Bernie Sanders for President – of Venezuela. Oliver Stone can be his Vice President in charge of keeping supermarket shelves stocked, Sean Penn his Secretary of Socialist Indoctrination and Education and Michael Moore Director of the Peoples’ Propaganda. This entry was posted in CURRENT EVENTS and tagged Bastiat, Bernie Sanders, Hillary Clinton, Hugo Chaves, Nicolas Maduro, socialism, Thomas Sowell by eburke93. Bookmark the permalink.